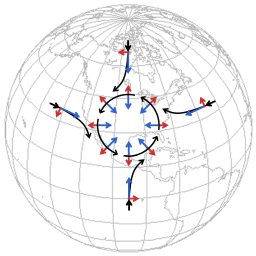 Formation of cyclonic flow around a low pressure area in the northern hemisphere. The blue arrows represent a pressure gradient force, and the red arrows represent the influence of the Coriolis effect. 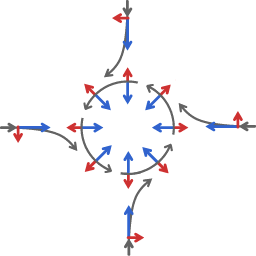 Highly schematic representation of cyclonic flow formation. Essential for the formation of cyclonic flow is that air mass that travels in westward direction tends to proceed to the north of the latitude it starts from. When a low pressure area forms on a non-rotating planet you expect that the air mass will flow down the pressure gradient and this flow of air mass will very quickly level the pressure field again. On Earth however, the Coriolis effect due to the rotation of the Earth must be taken into account. Image 1 represents two stages in the formation of cyclonic flow. The arrows are very much exaggerated to highlight the important aspects. As a low pressure area forms air tends to flow down the pressure gradient, towards the low pressure area. Whenever air mass acquires velocity relative to the Earth the Coriolis effect comes into play, deflecting the direction of motion. Since the deflection is always to the right of the downstream direction (on the northern hemisphere), the deflections tend to shepherd each other into flow around the low pressure area. The final result is that the air mass flows perpendicular to the pressure gradient, rather than down the pressure gradient, flowing counterclockwise (on the northern hemisphere). It is customary to represent the pressure gradient with isobars. In cyclonic flow the winds flow parallel to the isobars. The formation of cyclonic flow slows the process of levelling pressure gradient, to the point of almost preventing the low pressure from resolving. In the absence of any friction the cyclonic flow would persist forever. In atmospheric flow friction is quite small compared to other influences, but over time friction does dissipate the energy of cyclonic flow. The friction tends to reduce the velocity of the air flow. As the velocity of the air flow tends to go down there is opportunity for the pressure gradient force to contract the entire distribution of cyclonic flow. This contraction gives the air mass a velocity component towards the center of the cyclonic flow; and the coriolis effect then deflects this inward velocity component to velocity along the isobars. In other words, contraction of the cyclonic flow has the effect of sustaining the velocity of the cyclonic flow. A good way of thinking about this is in terms of energy conversions. When pressure gradient force contracts a field of cyclonic flow potential energy is converted to kinetic energy. A field of cyclonic flow loses energy all the time; dissipation results in loss of kinetic energy. At the same time kinetic energy is constantly replenished by conversion of potential energy to kinetic energy. In the image the cyclonic flow is circular, but of course in in the actual atmosphere the isobars always have a very irregular shape. Very often the following will occur in parts of the cyclonic flow: in some places the air mass will even move against the pressure gradient force, in which case kinetic energy converts to potential energy. Overall the energy of the cyclonic flow will dissipate, but the energy budget is not a case where the energy in the system flows only one way. In the case of cyclonic flow one-way-flow of energy would be that the potential energy that is associated with the pressure gradient converts to kinetic energy and not ever convert back. Image 2 is again a very much exaggerated and out of proportion representation in order to emphasize the important features. The tendency to deflect to the right of the downstream motion is with respect to the longitude lines and the latitude lines. Air mass that starts to flow in east-to-west direction subsequently proceeds to the North of the latitude it started from. If westward moving air mass would not proceed to the North of the latitude line that it started from, but would proceed towards the equator, then it would "collide" with the air mass coming from the south, and the cyclonic flow would simply not form at all.